A boozed-up driver who crashed into a car carrying a mum with two kids and knocked a rider off his motorbike in Huthwaite has been jailed. 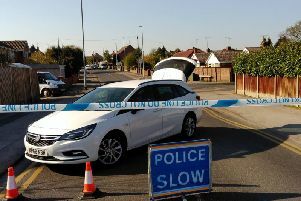 David Dolby was more than three times over the limit when his white Nissan panel van hit the Renault containing the woman, her five-year-old son and 15-week-old daughter, on Blackwell Road, at 4pm, on May 18. “She saw the van in the rear view mirror approaching at speed,” said Robert Carr, prosecuting. “It hit her four times, pushing her on to the other side of the road. “The van went past her and collided with a BMW which was catapulted into a motorbike. The rider was knocked off his bike. A test revealed he had 125 microgrammes of alcohol in 100 millilitres of breath, when the legal limit is 35 microgrammes. The rider was taken to hospital with minor injuries, but no one else was hurt. The bike was written off, the court heard. Dolby told police he had drunk three pints of lager at 11am that day, and three more at 3pm. “He said he felt in control,” added Mr Carr. Dolby, 49, of Little Lane, Huthwaite, admitted drink driving and driving without due care and attention when he appeared at Mansfield Magistrates Court, on Wednesday. The court heard he received a community order and a 28 month ban for drink driving in 2005. She said Dolby, a self-employed joiner, drank “around ten cans of alcohol every night” and had been drinking heavily since the death of his wife in 2003. He suffers from liver problems as a result, as well as depression. District Judge Tim Devas told him: “It is going to be a prison sentence. It can be nothing else. Dolby was also banned from driving for three years and nine weeks, and must pay a £115 victim surcharge.